I was reading a story earlier today in the Richmond News (thanks to Thor Diakow for passing it along) about how the producers of Game of Thrones are celebrating the coming final season of the show by trying to drown fans in a new wave of merchandizing (cue Yogurt from Spaceballs: "Merchandizing, merchandizing, merchandizing! Where the REAL money from the movie is made!") 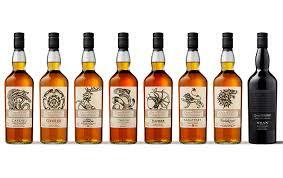 with the release of a GOT-themed line of whiskies. Apparently the BC Liquor Distribution Branch will be carrying the line (Or is the correct term "flight"? Flight of whiskies for a flight of dragons [yes, I just did that] — but Daenerys' pair doesn't really constitute a flight, does it?) in a couple of its stores. The Westerosi noble houses that have been included (along with the Night's Watch) are represented by different whisky brands (Talisker is doing the Greyjoy bottle, Oban's taking the Night's Watch, etc). Personally, I think this was a bit of a missed opportunity: BCLDB should have held a launch event for this hooch in partnership with White Dwarf Science Fiction Books in Vancouver, with the government offering a tasting and selling bottles on one side of the room, and the bookstore selling copies of the A Song of Ice and Fire series along with George RR Martin's other, related books from that world. Greyjoy: "We Do Not Slurp"
Arryn: "As High as Single Malt Can Make Me"
Baratheon: "Ours Is the Furry Tongue of the Hangover the Morning After"
*or: "A Lannister Always Pays His Bar Tab"
Targaryen: "Fire and Blood — with Notes of Honey, Tangerine, Peat, Pine and Chocolate"
The Night's Watch: "And Now My Bottle Has Ended"
So what other great — or minor — houses of Westeros need their their own whisky words? What should they be?